Harvest is now over and the newly made wines are either resting in oak barrels or stainless steel tanks. Last week we presented a rosé tasting and what better venue to do it than in the cellar, in between the tanks on a wet floor. 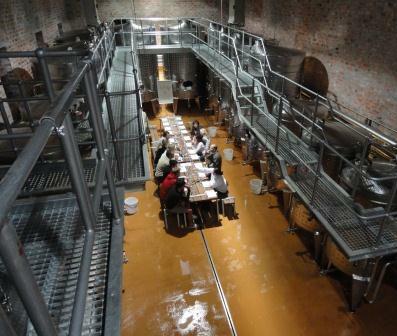 One of the rules of having the tasting in the cellar is no spitting, just swallowing (we do not have spittoons yet and spitting is not allowed on our clean cellar floor!). That definitely had its effect with more technical comments like “notes of strawberry on the nose” and “hints of watermelon on the palate” changing to more passionate and emotional comments like “now THIS is a wine that I can drink” or “this is such a romantic wine” as we progressed through the different flights. 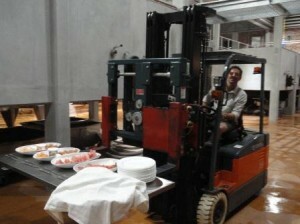 To stick to the industrial feel generated by the cellar atmosphere we pulled in our forklift to help us serve a selection of cold cuts and nice soft cheeses that went absolutely well with the rosé wines. What a nice evening! 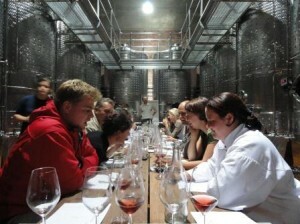 Slowly but surely the cellar is hosting more events. Hopefully in the future we will see you at one of them!